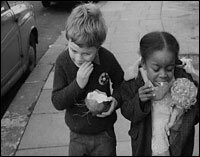 Jemima + Johnny is set in a Notting Hill still simmering with racial conflict, eight years after the race riots that erupted in the area. But while suspicion and racial tension permeate the adult world in this short film by Pretoria-born Lionel Ngakane, the bond formed between Jemima and Johnny as they happily tear around the neighbourhood defies any prejudice. A contemporary of Nelson Mandela in the ANC youth League, Ngakane began making films in the UK after being exiled from South Africa and Jemima + Johnny is notable as the first Black British film to win at an international film festival, when it was awarded 1st prize at Venice in 1966.